A Day in the Life...: Apple picking! daddy and his youngest boy! 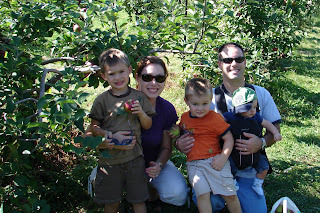 Do you remember about a year ago I posted a pic of 'the five of us'...it was right after I found out I was preggers and we went apple picking :) A lot has changed in a year. So happy we have our newest addition!